2017 has marked 30 years since Bill Kenwright’s production of the international smash hit musical Blood Brothers first toured the UK. In celebration, this iconic musical has been visiting theatres across the country coming to the Alhambra Theatre, Bradford from Monday 30 October to Saturday 4 November. Hailed as one of the best musicals of all time, Blood Brothers, written by award-winning playwright Willy Russell has triumphed across the globe. Scooping up no fewer than four awards for best musical in London and seven Tony Award nominations on Broadway, Blood Brothers is simply unmissable and unbeatable. This epic tale of Liverpool life started as a play, performed at a Liverpool comprehensive school in 1981 before opening at the Liverpool Playhouse in 1983, completing sell out seasons in the US, Australia, Canada, New Zealand and Japan. Blood Brothers also ran in London’s West End for 24 years, exceeding 10,000 performances, one of only three musicals ever to achieve that milestone. 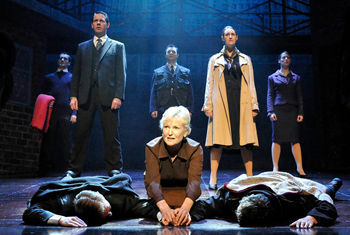 No stranger to Blood Brothers, ‘The definitive Mrs Johnstone’ (Manchester Evening News) Lyn Paul reprises the iconic role, one she first played in 1997. Lyn played Mrs Johnstone in the final West End performances at the Phoenix Theatre in 2012. Lyn rose to fame in the early 1970s as a member of the New Seekers. She was the featured vocalist on their 1972 Eurovision Song Contest entry, Beg, Steal or Borrow, in which they came second and lead vocalist on the 1974 number-one hit You Won’t Find Another Fool Like Me. Among the group’s other works, they recorded the song I’d Like to Teach the World to Sing, adapted from an advertising jingle for Coca-Cola, which sold over 20 million copies and still remains one of the 100 best-selling singles in the UK. She has also starred in the UK tour of Cabaret in 2013 as Fraulein Schneider, in Boy George’s musical Taboo and in Footloose - the Musical. Musical theatre regular Dean Chisnall returns to the role of the Narrator. He has performed in a number of musicals including Shrek the Musical (West End and UK tour), Love Never Dies, Never Forget, Evita and The Woman in White. Sean Jones reprises his role as Mickey, a role he has performed in the West End, including as part of the final cast at the Phoenix Theatre in 2012 alongside Lyn Paul, and on tour. It is not long before her brittle world crashes around her when she discovers herself to be pregnant yet again – this time with twins! In a moment of weakness and desperation, she enters a secret pact with her employer which leads inexorably to the show’s shattering climax. A sensational cast, incredible show stopping music, remarkable staging and five star performances make Blood Brothers an enthralling night of entertainment.